Soon after moving to Houston, I was walking a man-made bayou with my fly-rod. I was keeping a watchful eye on the water that flowed through the ditch. I wasn’t sure what fish species I could expect to see. I caught sight of a fish slowly swimming to the surface of the water. It opened its mouth like it was taking something from the top-water and then slowly disappeared into the deep murky depths. I had just seen my first spotted gar. Curiosity got the best of me and I began making casts into the water. My line went tight and the fight was on, but it was short lived. He spit the hook and swam away in earnest. Gar can live in a variety of environments. Here, Zach makes a cast to gar swimming in a ditch in southwest Houston. After this unique encounter, I went home and jumped on the trusty Google. The more stuff I read about gar, the cooler I thought they were. I knew I had to try and catch one on the fly rod. The next day, I headed back to the same ditch. I saw several gar rising to the surface of the water. I pulled out a large light-colored streamer. I took a smaller hook, and using 2X tippet, tied the smaller hook to the shank of the streamer. The smaller hook dangled about 3 or 4 inches behind the streamer. This small hook is called a “stinger”. After making several casts with the streamer and stinger, I finally got a gar to eat. The gar put up a great fight, but in the end, I was able to land the fish. The stinger setup worked quite well. Since then, I have caught many gar. I have fished for them with spinning gear, with my fly rod, and with my bowfishing rig. I have grown fond of this peculiar fish. Yes, they are ugly as hell and considered a “rough fish”, not highly prized by anglers, but I still can’t help but like them. In this article, I hope I can demonstrate what makes the gar unique and why they are so such a fun to target. Zach with his first gar on the fly. Judging by his facial expression, we don't share the same sentiments about this fish. First things first, let’s talk about the history of these interesting fish. Gar are found in the fossil record starting in the Late Cretaceous and they have virtually remained unchanged for the last 100 million years. Gar have elongated bodies and are covered in extraordinarily hard scales. These scales act as a coat of armor for the fish. Gar are predatory and have a very bony mouth that is full of needle sharp teeth. These bony mouths make it difficult to hook a gar by conventional fishing means. This is why I failed to hook the gar on my first encounter, before tying on a stinger. At first, when I saw the gar swimming in the ditch and breaching the water’s surface, I assumed that it was taking food from the top-water. I was mistaken. The gar was actually gulping air. Gar have a swim-bladder that can supplement their oxygen intake. This unique ability has enabled them to survive in fairly harsh conditions. They can live in stagnant and oxygen-poor environments that would otherwise kill a typical run-of-the-mill fish. In the wild, gar can live for several decades. A very large specie of gar, known as an alligator gar, can live to be over 100 years old. There are 4 species of gar that live in Texas. The longnose gar, spotted gar, shortnose gar, and alligator gar. 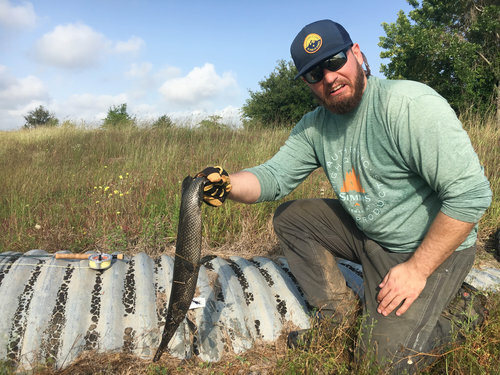 Around the Houston area, the spotted gar seems to be the most common. This is purely based on my own observations. Alligator gar are probably the most well recognized specie because of their monstrous size. The largest alligator gar ever caught on rod and reel in Texas weighed 279 lbs. The largest Alligator gar ever harvest in Texas with a bow and arrow weighed 290 lbs. I couldn’t find pictures for either of these records, but I did find a picture of another Texas river monster that was taken in 2009. One of the reasons why gar are so much fun to pursue is they can be caught by a variety of methods. As I mentioned before, flyfishing for gar can be a fun challenge. Using a stinger hook tied to the shank of a streamer hook is a method that has worked for me several times. However, there is another way to catch gar using a simple nylon rope. The objective here is to get the gar to chomp down on the rope, thus snagging and tangling the rope among the sharp and pointy teeth. This is a method that I have never tried for the simple fact that if I am going to release the fish, I don’t want to sit there and cut the shredded nylon out of the its mouth before releasing it. If I was planning on eating the fish, then I would be open to trying this method. But, If I plan on harvesting a couple of gar for the table, my preferred method is bow fishing. Many people think that gar are difficult to clean. For this reason, people don’t often think of them as an edible fish. However, I can attest that they are quite delicious. By using the right tools, they can be cleaned with relative ease. I first saw this method of cleaning gar on Steve Rinella’s online hunting show, MeatEater. Steve made it look pretty easy, and I must say, it is. Use the tin snips, make a cut at the base of the tail or behind the gill plate. Then, use the tin snips and cut down the entire length of the gar’s back. If you weren’t impressed by the gar’s armor-like scales before, you certainly will be after this process. Now, use the filet knife and cut between the white meat and the inside of the scales. Pull down on the scales as you cut to help loosen the meat from the inside of the scales. Once the scales are peeled down on either side of the body, use the filet knife and remove the long fillets that run along either side of the gar’s spine. This process is exactly the same as removing the backstraps from a deer. Wash the fillets in the bowl of clean water. Now you are ready to prepare the filets for cooking. Start by making an incision, with the tin snips, either behind the gill plate or at the base of the tail. Then, again using the tin snips, cut down the length of the gar's back. Cut the fillets into 1 ½” sections. Add a liberal amount of olive oil to a skillet and heat the oil on med-high. Golden gar bites with dijon mustard dipping sauce and a side of pickles. 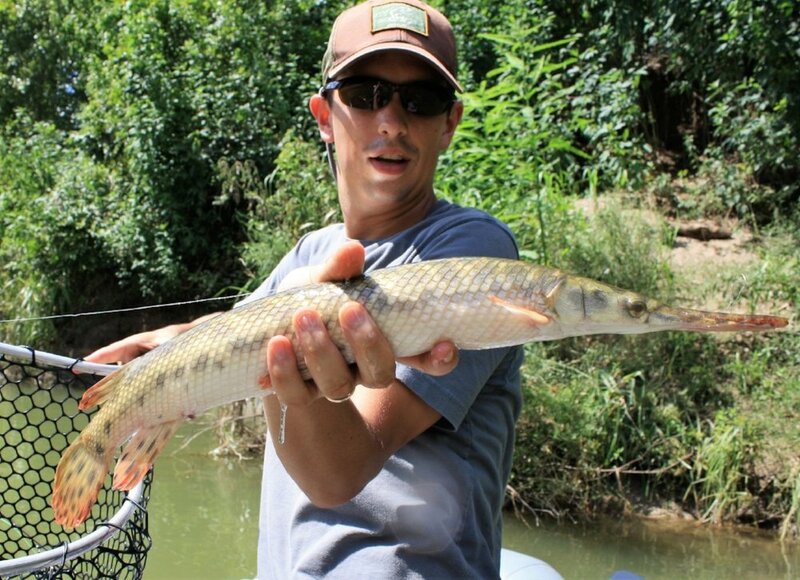 Gar are an enjoyable fish to target. They have an amazing ability to survive in harsh environments. They can be found from sprawling city ditches to remote creeks. Although they are not considered a game-fish, they should be respected. If you ever find your fishing line tight, and a gar on the other end, hang on and get ready for a wild fight.